Use the products the professionals use. This 100 foot cord comes with 100 sockets spaced 12 inches apart. Our traditional C7 bulbs are available in C7 Incandescent and C7 LED available for purchase separately. If you are looking for a more unique style try our incandescent G30 bulbs, G40 bulbs, and G50 bulbs. We carry a variety styles for you to match your design ideas. If you are purchasing glass bulbs, we always suggest adding an additional box. 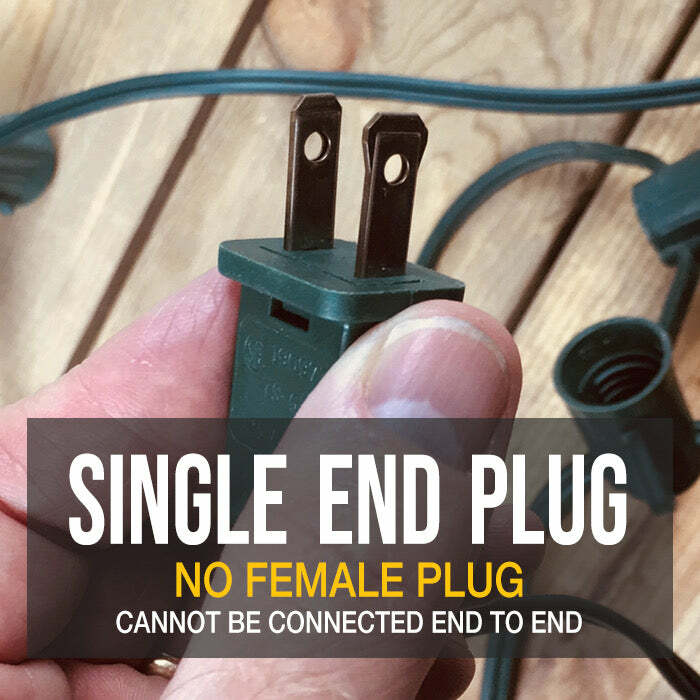 These cords are shipped with bulbs and come with one male end only. Meaning they can NOT be run continuously. Do not exceed a maximum run of 200 feet. Please consult a licensed electrician for assistance with instalation. See our handy article about SPT-1 vs SPT-2 if you have questions differences and application. These cords appear to be top quality, just what I needed. The bulbs have been installed and I'm looking forward to seeing the complete strands light up our city's Christmas tree in November. Q: Does the spt-2 100 foot cord have a male and female end? A: This cord has only a single male connector at one end. We suggest that if you are installing 2 strings of 100-foot stringer cord that you plug them into the splitter of your extension cord and branch them out like a capital T.
Q: What is the difference in the C7 cords? A: Sorry, Charles, I realize you may have been asking about SPT-1 vs SPT-2. They have different thicknesses of insulation. Both are 10 amp 18 AWG wire. The SPT-1 is the thickness that most commercial installers have used for years on residential installations. The SPT-2 insulation is slightly thicker and is tailored for environments that require a more rugged cord. 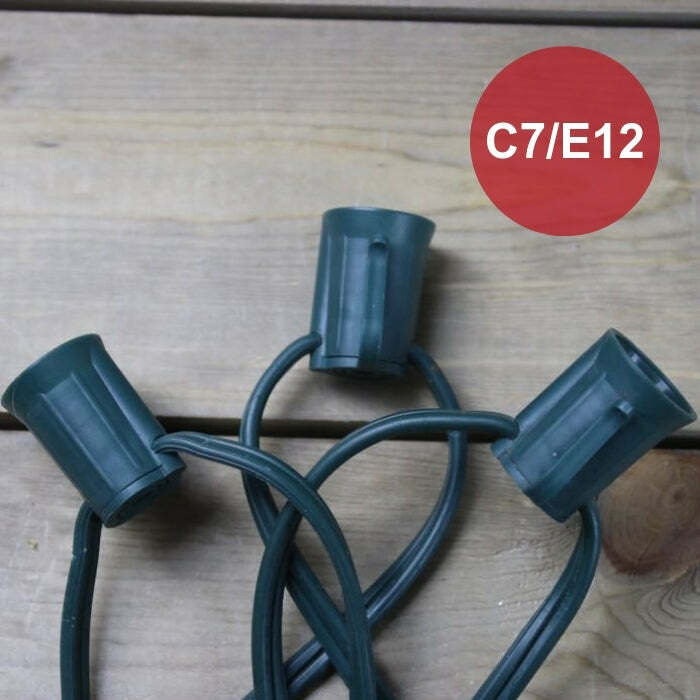 A: The C7 cords are made for the C7 bulbs that have E12 or candelabra bases. It's the same base that is used for a night light and a C7 bulb is about the same size as a light bulb. The bulb length from bottom of the base to tip is 2 1/8" long. So if you have bulbs that have the same base as a night light, these will be a good fit. The C9 bulbs are 2 7/8 inch from base to tip and fit the C9 stringer wire. They are the bigger bulbs that many people remember seeing as a kid. They have in intermediate or E17 base. Q: How many bulbs will this cord accommodate? Are your LED C7 bulbs suitable with this cord? This strand has 100 sockets spaced 12 inches apart. So it will accommodate 100 lights. 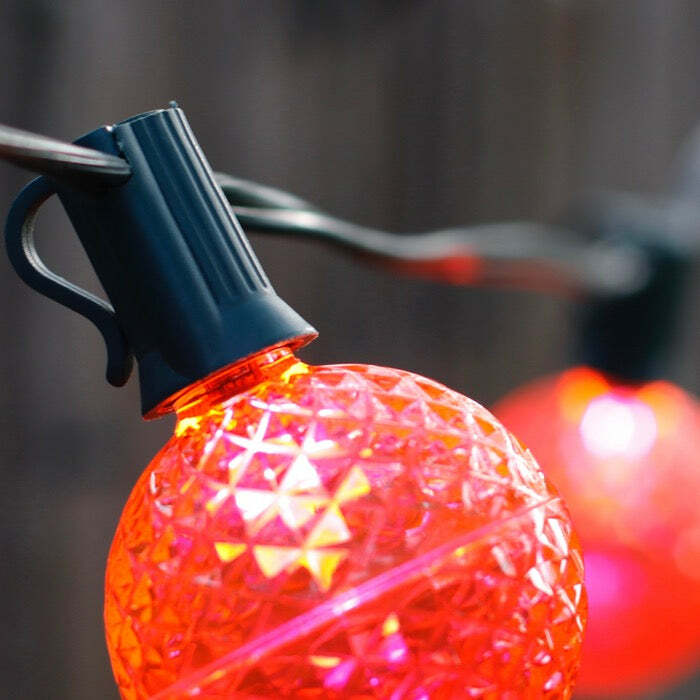 You can use either our LED or traditional incandescent bulbs for this cord and either work great. The stringer wire works with any bulb with an intermediate or E17 base.